>Half Moon Cay is a private island paradise in the Bahamas, with 2 miles of perfect white sand running along the islands beautiful crescent shaped main beach it has a host of water sports, ride horse back on powdery white sand or encounter silky stingrays. Take a horseback ride that will take you up to the highest point on the island where you will have an ideal photo opportunity, from here your horse will take you swimming in the surf along the island. Join a naturalist guide for an informative walk through this tropical paradise, you will see sea grape trees, curly tailed lizards, and learn about Bahamian history. Visit Bonefish Lagoon and enjoy an educational stingray encounter where you get to touch the rays' silky wings and feed these amazing creatures. 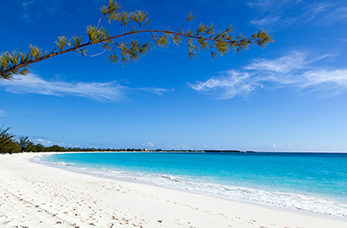 You couldn’t visit Half Moon Cay without spending some time on the crescent shaped beach. There are plenty of facilities including a bar, a Bahamian straw market, it also offers a number of private cabanas that to rent during your day on the island.